Peaks at the middle. Trend of US food consumption by age, 2016. Comparison of age vs what we eat shows food consumption peaks around 50 years of age, that’s much later than the peak of our metabolism. If we follow the saying, ‘we are what we eat’, then we are at the peak of our game in our 50s. 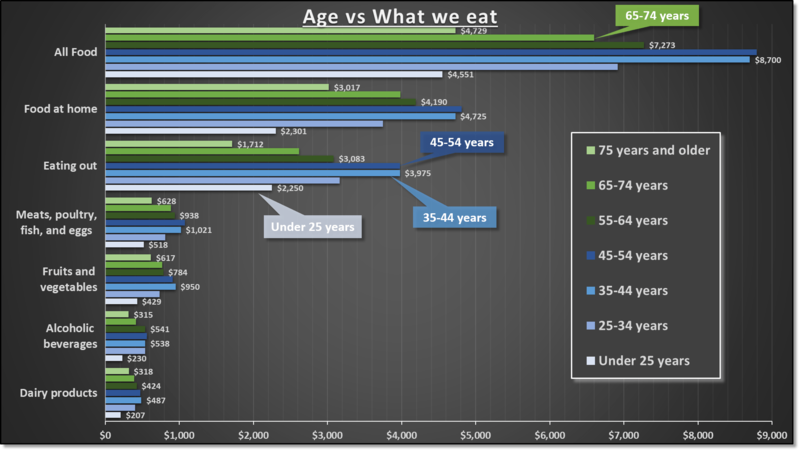 The amount of food eaten vs age has a nice bell cure showing our consumption is highest in middle ages and both young (below 25 years) and the old (75 years or older) pretty much spend the same. As we age, the trend is to eat more often at home. That’s one reason why so many food chains focus on the younger population. The young seem to consume less meat compared to the older generations, contrary to the assumption that we eat more protein as we grow. The drinking habits seem to stay same once we are out of college. The expenses by the younger generation is lower mainly due to what kind of alcoholic drinks they consume. The older generation with fat wallets seems to splurge more often than the typical college drinker. Our fruits and vegetables consumption is high before 50, which mainly seems to be due to more awareness in recent years towards eating vegetarian & reducing red meat. Overall, Americans spend about 13% of their income of food. The younger and older generations spend only about half of what the middle aged Americans spend. That may be skewed by the fact that middle aged people are the family earners and they provide for the other two groups. Food expenses are not the biggest concern for most Americans. But what we eat has serious consequences as the cost of healthcare is directly related to what we eat. What we eat also defines our working habits as well as how long we are able to work. Source: www.bls.gov: Consumer expenditure survey (data in .pdf format, .xlsx format) Oct 12th, 2017.